The stash enhancement continues although most of the following will be used during holiday knittng. 1. Brown Sheep Nature Spun worsted in Turquoise Wonder and Brown Sheep Handpainted Originals in Tropical Wave for Mohair Ballet Slippers. 2.Brown Sheep Nature Spun worsted in French Clay and Brown Sheep Handpainted Originals in English Garden for Mohair Ballet Slippers. 4. Sock Blockers in S,M, and L. (Still to small to block the brothers socks. Only 19.95 and free shipping from Inspirations Yarn They also have excellent service). 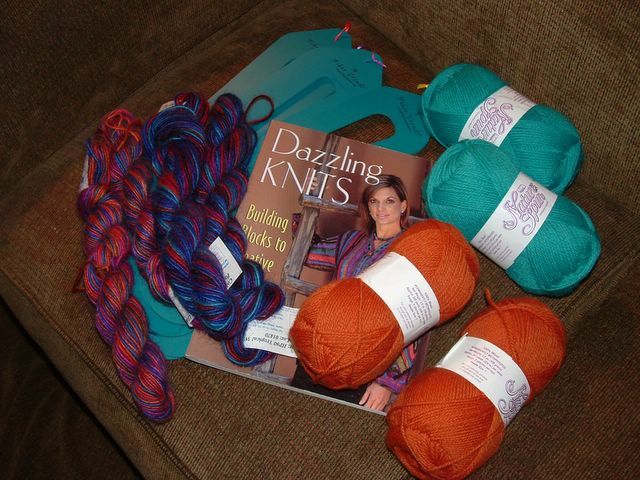 Okay, between Part one and Part two, I'm having stash envy! I've always wanted some of those green, sock blockers. I may just have to purchase some once I get back on my feet.